While compiling an unprecedented census of one billion stars in our Galaxy, ESA’s Gaia mission is also surveying stars beyond our Milky Way. A new image of M33, also known as the Triangulum galaxy, shows tens of thousands of stars detected by Gaia, including a small stellar census in its star-forming region NGC 604. This is a striking example of the mission’s potential to detect and characterise stars in nearby galaxies. Gaia, ESA’s mission for precision astrometry, was launched in December 2013 and has been scanning the sky since 25 July 2014. While its goal is to survey one billion stars in our Milky Way galaxy – about one per cent of its total stellar content – the on-board detection system records a much wider selection of cosmic sources. Even though the majority of objects detected by Gaia are Milky Way stars, the satellite has also been observing a wealth of stars that belong to other galaxies, providing an important database to study the stellar populations of galaxies beyond our own . Observations of the M33 galaxy provide a clear demonstration of Gaia’s prospects for extragalactic studies. Located some 2.4 million light-years away, M33 is one of our neighbouring galaxies and is part of the Local Group, the assembly of galaxies that includes our Milky Way and the Andromeda galaxy. A spiral galaxy with less than one tenth the mass of the Milky Way or Andromeda, M33 is the third largest member of the Local Group and is thought to be a satellite galaxy of Andromeda. 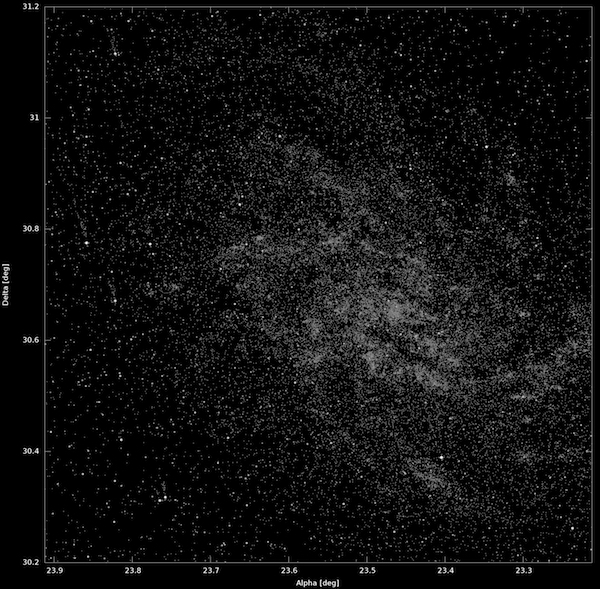 A new image of the patch of sky where M33 is found, based on 26 scans performed between 7 and 9 December 2016, shows all points where Gaia detected one or more sources. Gaia’s detections correspond to about 40 000 of the galaxy’s brightest stars, a small fraction of the total stellar population of M33, which amounts to roughly 40 billion stars. The high stellar density of this region means that Gaia can only detect a fraction of these extragalactic stars each time it scans this portion of the sky. Very dense stellar fields – like external galaxies, as well as the densest portions of our Galaxy, such as Baade’s Window  – are particularly challenging for Gaia. Even if very powerful, the data processing units on the satellite have a limit to the number of objects that can be observed per second without saturating the onboard computer. 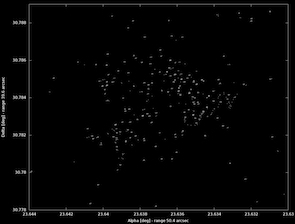 As time goes by, Gaia will survey these regions on many more occasions and with different scanning configurations, eventually recording more of the detected stars. 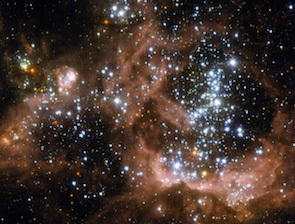 M33 hosts a well-known star-forming region, NGC 604, which is home to many newborn stars. With a density of about one million stars per square degree, NGC 604 is one such challenging region to observe. The star forming region NGC 604 viewed by Gaia (left) and Hubble (right). Credit: ESA/Gaia/DPAC (left); ESA/Hubble & NASA (right). A comparison between the Gaia detections in that region and a high-resolution image of this stellar nursery from the NASA/ESA Hubble Space Telescope shows that Gaia has detected about 150 individual stars in the NGC 604 region, which spans only about 0.55 square arcminutes in the sky. This number might not sound big in absolute terms, but it is impressive when considering that the observed field is about 2000 times smaller than the area covered by the full Moon in the sky, revealing that Gaia is able to detect a significant number of extragalactic stars. This is even more remarkable given that Gaia’s observed stars are automatic detections obtained by the satellite’s onboard computing system while scanning over the region, whereas the stars detected in astronomical images, such as those from Hubble, are the result of dedicated observations obtained by pointing at specific regions on the sky, which are later analysed by scientists. With this quality of data, observations of stellar fields in Local Group galaxies like M33 will yield estimates of the position, parallax, and proper motion for a wealth of extragalactic stars – these will be published in the future Gaia data releases . In addition to stars in the Milky Way and nearby galaxies, Gaia has been detecting distant galaxies and quasars – the bright cores of distant galaxies with an active black hole at their centre – as well as hundreds of thousands of asteroids and other small bodies in the Solar System. Baade’s Window is an area on the sky toward the centre of the Milky Way with little contamination by interstellar dust, where the density of stars reaches up to three million per square degree. Due to the great distance of these extragalactic stars, they are mostly among the faintest sources detected by the satellite, requiring an especially meticulous analysis of the data in order to interpret them correctly.